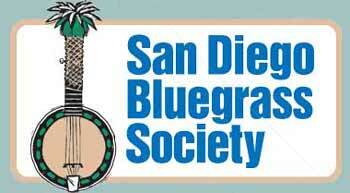 The San Diego Bluegrass Society is a 501(c)(3) nonprofit corporation dedicated to the preservation and promotion of bluegrass music in the San Diego area. Type your email address in the box above, then hit the GO button. We'll send you occasional emails about San Diego-area bluegrass events. To receive even more info, become an SDBS member. Educating all those who are interested, especially young persons, about the history of bluegrass music in America. Organizing regular jam sessions and open mics on the second and fourth Tuesday of every month, an instructed slow jam on the 3rd Monday, with a featured band on the fourth Tuesday. Presenting bluegrass concerts by local and traveling bands. Working cooperatively with other bluegrass organizations, including IBMA and our sister organization in San Diego, The North County Bluegrass and Folk Club in promoting a variety of bluegrass related activities. Co-producing Summergrass, a premier 3-day bluegrass festival held each August. Organizing an annual Bluegrass Day at the Fair, at the San Diego County Fair in Del Mar (see photo at right). Conducting a music outreach program with SDBS’s Emma’s Gut Bucket Band to bring bluegrass music and instruction to public and private schools, to senior centers, assisted living facilities, homeless centers and the like at no cost, Visit the Gut Bucket Band website for more info. Such other activities as deemed appropriate to promote bluegrass music in San Diego. SDBS is governed by a nine member Board of directors. Board members are elected every two years for two-year terms, and the Board then elects a president, vice president and other officers every year. Board membership is open to all SDBS members. Board of Directors meetings are held once a month on Sunday afternoon from 4:30 to 6:30 pm. If you have an item you would like to bring to the Board, or if you would like to attend a Board meeting, please send an email to SDBS President Mary Jane Cupp - visitors are welcome. Current board members and officers:: Dwight Worden, Becky Green, Treasurer; Mary Jane Cupp, Board President; Jack Lohman:; Pete Varhola, John Deckard, Mark Pullin, vice president, Kathy Wolf (ex officio) , events & raffle; Nanncy Brunson, Secretary; and Roger Taylor. Other key volunteers include: Mike and Vonnie Tatar lead the Summergrass program and Vonnie does the Featured Band booking for SDBS. Phil Levy chairs our band selection committee. Ed Meyers operates an info email alert program for SDBS. SDBS is an all-volunteer organization, and we welcome your help! Whatever your skills, we can put them to good use! Contact us at info@sandiegobluegrass.org to volunteer! Not a member already? Join us!